As you make your way down Terminal Drive you can get directions towards the terminal that you need to depart Salt Lake City International Airport. Salt Lake City International is located just 4 miles west of downtown, offering expansive views of the city’s famous canyon sunsets alongside a modern interior that’s designed to keep passengers relaxed. Enjoy every aspect of the city by keeping track of the little things on the way, whether it’s where to park at the airport or where to eat when your plane lands at 3 AM. Get started on your exciting trip by making sure your vehicle is as taken care of as you. Park on-site at Salt Lake City International, enjoying the easy-to-find options, whether it be the Hourly/Daily Garage, which are attached to the terminals, or the Economy Lot, located slightly further, but with the added benefit of complimentary shuttles. Save time by reserving your spot early with SLC Airport’s Click-and-Park program, which allows for Premium Parking on Level 1. 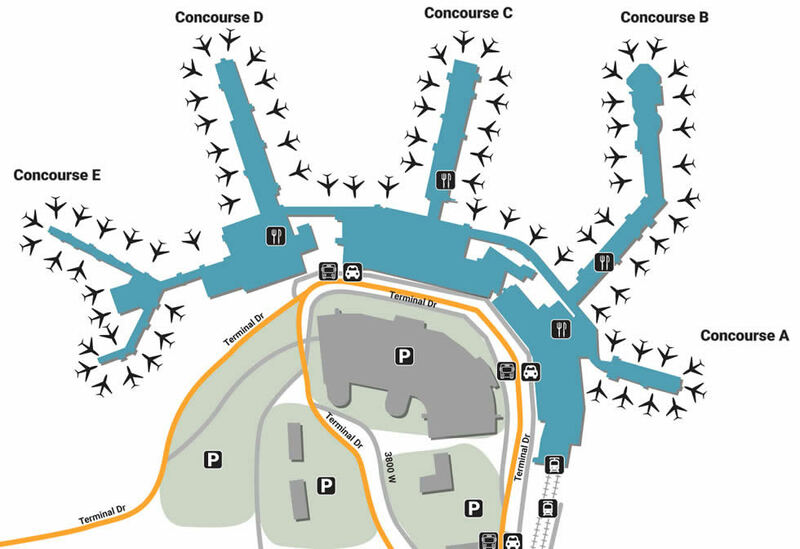 Hourly Parking is also on Level 1, while Daily parking is located on Levels 2 and 3. The airport is especially conscious of helping those in need. With extensive handicap accessibility that offers TDD phones, elevators, ramps, and wheelchair services, there’s nothing to worry about. Appreciate where you are, in the moment, by also enjoying the beautiful art that connects each terminal. Make sure your pets are relaxed as well by taking them to either of three animal relief stations, all of which are located near grassy areas beside the parking garage. There are also several infant-care rooms located in the lobbies of both terminals, all of which accommodate to special needs. There’s something about getting something new, something that makes your eye gleam over. Make that feeling happen by directing yourself toward something bigger, whether it be the vivid technology of InMotion Entertainment (Terminals 1 & 2) or the adventurous outdoor gear at No Boundaries (Terminal 2, Gate C). Soar above everything in style by doing some shopping at Radio Road, located in Terminal 1, Gate B. Make sure you also turn that light bulb on by getting a magazine at The Economist (Terminal 2, Gate C) while simultaneously passing by the headlines of Sunset News (Terminal 1, Gate A). Make sure no stone goes unturned by allowing your stomach to stay settled. Walk strong after a hearty meal at Market Street Grill (Terminal 2, Gate C), a local seafood restaurant that’s been open since 1980. Afterward, treat your sweet tooth by enjoying a dark delicacy from Rocky Mountain Chocolate Factory, located in both Terminals. If you’re in the mood to try some fast-food gourmet, head to Cat Cora’s Gourmet Market, located in Terminal 2’s Upper-Level Rotunda.